I wouldn’t need much luggage. A small holdall would probably suffice, containing a notebook and novel as well as a sandwich, scarf and gloves. 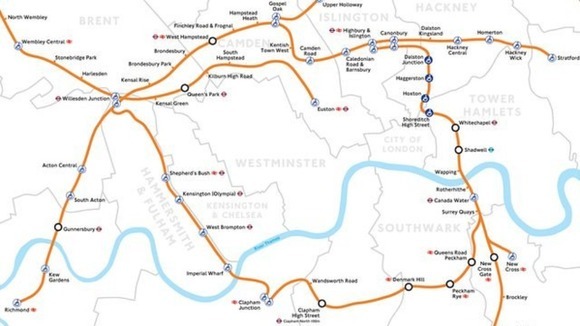 The last section of the London Overground rail orbital was officially opened at the beginning of the week. The orbital makes use of a group of pre-existing lines a compass would be proud of: the East, South, West and North London lines. Only one stretch of track of less than a mile in length was required to be laid, in order to link Queen’s Road Peckham to Surrey Quays. By my count the route services 35 stations, and passes through 12 of London’s 32 boroughs. Tentacle-like lines run away from the orbital using the Gospel Oak-Barking and Watford lines taking the total number of boroughs called at to 20. The aim was at least three-fold: regenerate some of London’s poorer suburbs, reduce passenger numbers on congested central London routes, and create reduced cost transport options. By not entering London’s very centre – Zone 1 – ticketing costs are lower than alternative routes across the city. Only time will tell if many of these aims are met. The new London rail orbital route. Photo courtesy Transport for London. The issue on all orbital routes for the adventure traveller is to know where to begin. It is as correct to begin at a small midway station like West Hampstead as it is to start at the purpose-built additional platforms of Clapham Junction, one of the route’s terminal stations. It is equally troubling to decide whether to travel East or West, clockwise or anticlockwise. Heading East, trains pass along the South London line towards Highbury and Islington in the north of London. The tracks cross the River Thames at Rotherhithe using the Thames Tunnel designed by Marc Isambard Brunel and his more famous son Isambard Kingdom Brunel. It was the first tunnel built beneath a navigable river, designed initially for use by horse-drawn carts. The term orbital suggests a continuous train run which the London orbital is not. From Highbury and Islington a change of trains is required as the orbital swaps from the East London line to the North London line. Even the city’s other orbital, the London Underground’s Circle line, has a need to change trains at Edgeware Road. Compared by none other as the Mayor of London as the “M25 of rail”, there are some significant differences. This is not a high-speed rail line as the comparison to a motorway might suggest. It is promised the line will not be as slow or congested as the M25 can be either. Nor is it blue. The livery is orange; the sort of orange impossible to miss even if the entire planet’s colouration had been stolen by a Bond-style villain.